If you haven't walked the world-renowned High Line, now is your best chance to enjoy it before tourists crowd its lanes in season. Even if you have, you’ll find the park exciting again, fresh spring landscaping bordering the trail from start to finish. 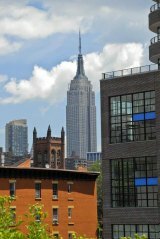 And now, the High Line is easier than ever to get to. The new subway extension for the 7 Train delivers you within a short walk of the north entrance. Roosevelt Islanders take the F to 42nd Street and transfer. In Chapter 3 from Is It Always A Love Story?, confronts the man he was before going to war in Vietnam and finds a stranger he left behind. What's next? Chapter 2 from Is It Always A Love Story? finds Peter McCarthy returned to his hometown in Upstate New York, reuniting with family and friends, unsure about all that comes next. He's changed but fears the loves, family, values and hometown he left behind, two years before, have not. Chapter 1 from Is It Always A Love Story? finds Peter McCarthy returning to America after a two year tour in Vietnam, not quite home, preparing to go the rest of the way. Assimilate or not? He's changed but dreads that what waits ahead - loves, family, values, his hometown - has not. In September, RIOC announced a big win. FIGMENT NYC, a popular annual art project, will leave Governors Island for Roosevelt Island's Lighthouse Park in 2019. On the 23rd, its leaders invite you to get acquainted and, maybe, grab a chance to get your hands in the clay. 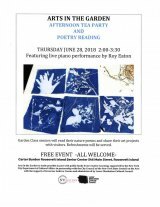 Thursday, July 28th, will be a day to remember for Roosevelt Island as the Carter Burden Roosevelt Island Senior Center invites everyone to a special free event, an Arts in the Garden afternoon tea party and poetry reading accompanied on the piano by legendary pianist, our own Roy Eaton. 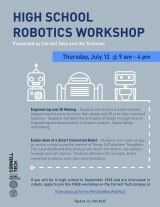 If you're interested in robotics and will be in High School in September, you're welcome to attend a one-day Robotics Workshop at Cornell Tech on July 12th. Sign up now. Space is limited. Like other pioneers, Moshe Feldenkrais, dissatisfied with medical solutions available at the time, dug deep into his own knowledge and experience to research a way to cure a chronically injured knee. He'd been told surgery was his best option, and it would leave him with a permanent limp. Instead, he figured out how to heal himself, then spent the last 30 year of his life developing the Method that bears his name. At the Senior Center, you're invited to try it out for free. 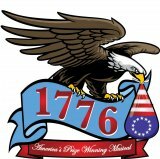 Until Lin Manuel Miranda's Hamilton shook up Broadway a few years back, the biggest historical musical about the Founding Fathers was Sherman Edwards and Peter Stone's 1776, a show blending serious history, drama, music and humor that magically makes it all work. It won the Tony for Best Musical, and now under the direction of Jacqueline Lucid, it's coming to the Howe Theatre under an expanding entertainment tent set up by Roosevelt Island's Main Street Theatre & Dance Alliance. Brave New World Theater's Claire Beckman finds parallels with The Cherry Orchard in the Antebellum American South. Roosevelt Island's own Roy Eaton is music director.